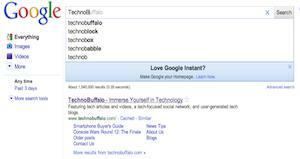 The internet has been in a panic lately about Google's newest shiny object: Google Instant Search. It often seems as if the entire Internet is populated with test subjects for The Goog, doesn't it? Google rapidly picks up and promotes features, applications and companies only to discard them like so much play room detritus (witness Wave, Dodgeball, more). This latest in a long line of Google experiments has the SEO community, parents, teachers and many other seemingly unrelated sectors in an uproar. I remember when Google first started adding the "Did you mean…" line to their searches, and the same uproar happening then. This takes that corrective algorithm to the next level – who needs spelling, math or other basic skills when The Goog is doing it for us? As for SEO – those who have been utilizing location based SEO and social SEO in recent months have an edge in Google's new Instant world. If your business has a Google Place, a Twitter account, a Facebook page, a regular web site that is SEO optimized and uses other location based check in services like Foursquare and Yelp, you should still see your business popping up close to the top. The biggest change you will see at first is that more weight is given to local – your Place may show higher than your site in some cases. This is because Google Instant search offers results weighted at least in part by where you are accessing the internet from. Sound a bit Big Brother to you? It is, but never fear – for at least a little while longer you can keep Instant turned off and use the classic search functionality. That's a big help for folks like me who do a lot of date-sorted searching in the day to day of business life. One side effect of Google Instant for me? I'm actually trying Blekko, Bing and other search tools to have a back up plan ready in case Google goes all-in with Instant and I find myself in need of search history and other features an instant search won't offer. I recommend you do the same.